These are the four stained glass windows situated on the first floor of the Monument in the Museum room. They were designed by David Roberts and made by James Ballantine. The installation was proposed by the Trustees’ Committee in 1855 and £300 found from the Special Purposes Fund, the windows would ‘convey to distant times a favourable idea of the state of the Art in Edinburgh in the 19th century’. 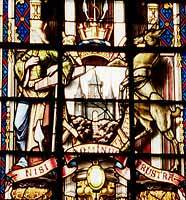 The first window shows the coat-of-arms of the City of Edinburgh with the motto ‘NISI DOMINUS FRUSTRA’. From early times, and certainly from the 14th century, Edinburgh (like other royal burghs of Scotland) used armorial devices in many ways, including on seals. In 1732, the ‘achievement’ or ‘coat of arms’ was formally granted by the Lord Lyon King of Arms. Two figures or ‘supporters’ flank the shield. The doe or hind on the right is associated with St Giles, the city’s patron saint. 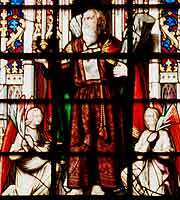 The second window shows Saint Andrew the patron Saint of Scotland. Andrew was a fisherman from Galilee, who went on to spread the Christian religion in Greece and Asia Minor. He is believed to have been crucified on an X-shaped cross known as a Saltire Cross (one of the many Medieval customs of torture) in Patras in Southern Greece. Some 300 years after his death, the Emperor Constantine was going to move the saints bones, and legend has it that a greek monk called Saint Rule, was warned of this in a dream by an angel, who told him to remove the saints bones to the "ends of the Earth" to keep them safe. Scotland was as near to the ends of the Greek world as you could get at that time, and and it was here that St. Rule was shipwrecked with his precious cargo. The monk brought the holy relics ashore at what is now St Andrews. 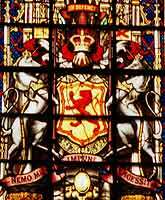 The third window shows the coat-of-arms of Scotland, the Lion Rampant shield flanked by a pair of unicorns. The motto of the Order of the Thistle "NEMO ME IMPUNE LACESSIT", which means "No one injures (attacks) me with impunity", is written on a scroll underneath. 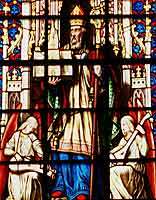 The fourth window shows Saint Giles the patron saint of Edinburgh. Giles was a popular saint in the Middle Ages. He was the patron saint of cripples and lepers, and his reputation spread through France and England to Scotland, partly as a result of the Crusades.